Galway Metals Intersects 11.8 g/t Au over 12.8m and 6.1 g/t Au over 15.1m at Clarence Stream - Galway Metals Inc.
(Toronto, Ontario, October 10, 2017) – Galway Metals Inc. (TSX-V: GWM) (the “Company” or “Galway”) is pleased to report assay results from 21 diamond drill holes (3,118 metres) from its Clarence Stream gold property located in south-western New Brunswick, Canada. Galway secured an option agreement to acquire a 100% interest in the property on August 3, 2016 and on September 26, 2017, the Company released an updated National Instrument (NI) 43-101 resource statement prepared by SRK Consulting (U.S.), Inc., which included a maiden pit constrained resource estimate ( click here to view resource update). 17.4 g/t Au over 5.9 m, including 39.8 g/t Au over 2.0 m, and 1.1 g/t Au over 7.5 m, and 2.5 g/t Au over 5.5 m, starting at a vertical depth of 9.5 m.
1.4 g/t Au over 5.6 m, starting at a vertical depth of 46.5 m.
The resources at Clarence Stream are contained within 2.5-km of Galway’s 65-km strike length. There are many additional strong targets identified that exhibit coincident highly anomalous glacial tills, soils, boulders and chip samples, along magnetic lows. The first satellite target was recently drilled with 11 holes at Jubilee, located five-km southwest of the South Zone, with assays pending. The Company believes that by exploring additional untested targets, a new emerging gold district in New Brunswick could be uncovered. The drill intersections highlighted below are significant because they enhance the pit-constrained resource by being wider and/or higher-grade than the existing surrounding drill results. Wider intersections are particularly important in driving the depth of the pit-constrained resource deeper. The above drill holes have assays pending before and after the intervals given (i.e. the above intersections were rushed to the assay lab whereas the rest of the intersections were not). Notes: Hole CS17-366 is cut to 17.0 /t, while the other South Zone top cuts in this press release are 40.0 g/t; they were determined in different domains as provided by SRK in the resource estimate released September 26, 2017 . The lower cut-off grade for drill intersects provided above, and applied in the pit-constrained resource estimate, was determined by SRK at 0.42 g/t Au. Drill holes AD17-129, 132, 133, and 136, and CS17- 364 did not return significant assays. 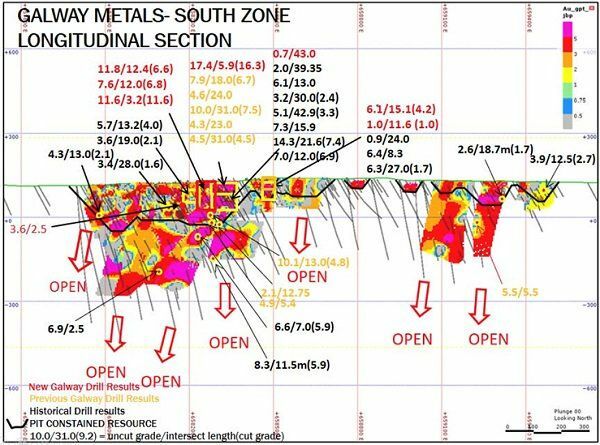 For a complete list of all Galway drill results at Clarence Stream and the historical drill hole locations, refer to the North Zone table, South Zone table and Historical Drill Location tableon the Company’s website at www.galwaymetalsinc.com. Hole CS17-366, which returned 6.1 g/t Au over 15.1 m, is located 20 metres (m) vertically above earlier hole CS05-138 that contained 4.7 g/t Au (2.4 cut) over 8.0 metres (m). Hole CS17-365, which returned 1.0 g/t Au over 12.0 m, is located 25 m vertically above earlier hole CS05-139 that contained 1.1 g/t Au over 7.5m. Hole CS17-363, which returned 3.6 g/t Au over 2.8 m, is located 30 m vertically below earlier hole CS05-170 that contained 1.0 g/t Au over 8.0 m and is open below for 120 m.
Hole CS17-362, which returned 11.6 g/t Au over 3.2 m, is located midway between earlier holes CS17-361 and CS01-24 (50m gap) that returned no significant values. Hole CS17-360, which returned 11.8 g/t Au over 12.4 m, is located midway between earlier holes CS07-262 (7.3 g/t Au over 3.5 m) and CS01-38 (3.8 g/t Au over 5.5 m) (50 m gap). Hole CS17-359, which returned 7.6 g/t Au over 12.0 m, is located midway between earlier holes CS01-48 (2.0 g/t Au over 39.4 m) and CS01-38 (3.8 g/t Au over 5.5 m) (50 m gap). Hole CS17-358, which returned 17.4 g/t Au over 5.9 m, is located 30m vertically above earlier hole CS01-44 that returned 5.1 g/t Au (3.3 cut) over 42.9 m. It is thought that hole CS17-358 only intersected the south edge of the zone. Hole CS17-355, which returned 0.74 g/t Au over 43.0 m, is located midway between earlier holes CS01-45 (0.7 g/t Au over 7.5 m) and CS01-55 (9.4 g/t Au over 1.5 m) (50 m gap). Holes CS17-356, 357, and 361 intersected low-grade intervals similar to surrounding holes. Hole CS17-364 is located in a waste gap between shoots of mineralization. Holes CS17-355 and CS17-360 are particularly important because the widths attained should drive the depth of the pit-constrained resource deeper (12.4-43.0 m now vs. 4.6-14.7 m previously). Holes CS17-365 and CS17-366 are important because they are wide intersections very close to surface where moderate widths were found before (12.0-15.1 m now vs. 4.5-5.0 m previously). 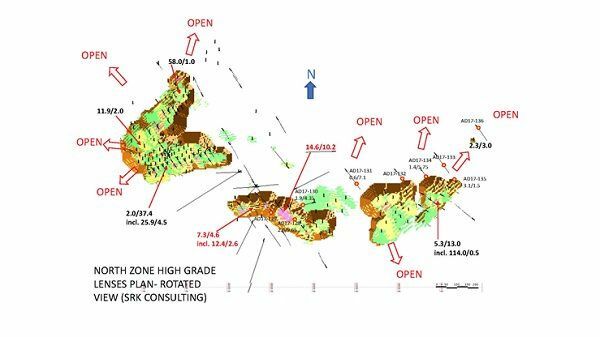 In the North Zone, hole AD 17-128, which returned 2.0 g/t Au over 9.7 m, is located midway in the 102 m gap between holes AD 17-127 (14.6 g/t Au over 10.2 m) and CS02-99 (1.1 g/t Au over 19.1 m), within a low-grade portion of the pit-constrained block model. Holes CS17-130, 131, 134, and 135 extend the southern limb of the North Zone 50 m to the north and east. Hole CS17-131 appears to join the two south pits together. Holes AD 17-129, 132, 133, and 136 are located in waste gaps between shoots of mineralization. 1,873 metres were drilled in 12 holes in the South Zone. One hole is pending. 1,245 metres were drilled in 9 holes in the North Zone. Clarence Stream is located along, and controlled by, the Sawyer Brook Fault boundary of the Gander and Avalon terranes of the Canadian Appalachians in Palaeozoic age intrusive and sedimentary rocks, which are the primary hosts of gold mineralization. The deposits are intrusion-related quartz-vein hosted fault-controlled gold with pyrite, base metal sulphides, and stibnite plus anomalous concentrations of bismuth, arsenic, antimony and tungsten, with sericitization and chloritization. Gold is present in two main areas-the South Zone along the Sawyer Brook Fault and the North Zone 3.5 km NW. The South Zone is steeply dipping, east-northeast trending, with two horizons identified to date, and multiple shoots extending over more than 2.5 km with the resource extending to a maximum depth of 336 metres to date along contacts and within sheared and altered metagabbro and microgranite sills and dikes that crosscut the meta-sedimentary rocks and are related to the Saint George Batholith to the south (presence of hornfels + veined and altered auriferous microgranite dikes + high concentrations of Bi, As and Sb). The North Zone consists of four lenses that appear to be part of the same shallow dipping horizon up to 37.4 metres thick within a one km by two km area to a maximum depth of 90 metres, and is hosted within metagreywacke and argillite, and in quartz veins with stringers and semi-massive stibnite, arsenopyrite, and pyrite.